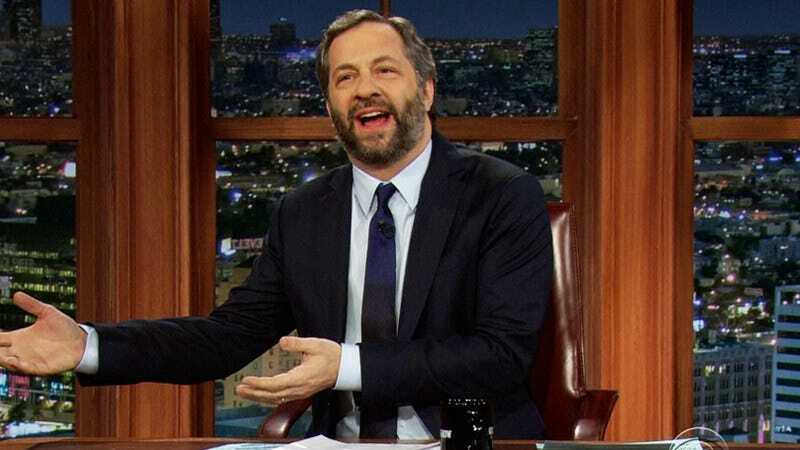 Judd Apatow has been rightly celebrated as one of the most influential comedy icons of the 21st century. Time and again, he’s delivered TV shows and films filled with wild belly laughs both outsized (The 40 Year Old Virgin) and relatable (This Is 40). Truly, the man loves his comedic premises. So get your funny bone ready, because in a new interview, the writer-director reveals that he’s working on his most humorous topic yet: the uproarious world of soldiers returning home from war. Appearing on Pete Holmes’ You Made It Weird podcast, Apatow lets loose with the gut-busting news that he’s writing a screenplay with author Phil Klay, author of Redeployment, about soldiers serving in Iraq and Afghanistan, and what happens when they return home. “Right now I’m like, ‘I’m not sure what to write about,’ although I’m trying to write a little bit about service, sacrifice, things like that,” the funnyman cracked, eliciting hoots of laughter from anyone who knows how ridiculous those concepts are. “But it’s just about: what happens to soldiers who return to a country that isn’t even that aware that we’re at war? And different issues that they face that people don’t think about too much.” We haven’t listened to the podcast, but that sounds like the moment for one of Apatow’s signature, fart-noise sound effects. Unfortunately, the film isn’t in production yet, so for now we’ll have to content ourselves with dreaming about what kind of goofy hijinks people potentially suffering from PTSD will embark upon.